I made a person. And a movie. Last summer, when I was pregnant with my daughter, my friends and I shot a horror/comedy feature film called “The Shower.” My husband wrote and directed it and we all raised the money to make the movie through grassroots fundraising on our website www.TheShowerTheMovie.com. We made the movie and I even went into labor on set. You’re welcome. Now we are almost done; we’re getting ready to head into post-production and are running a campaign called “500 DONORS IN 500 HOURS.” Please watch this two minute video where a very cute, blood-drenched fellow (my husband, Alex Drummond) shows clips and behind-the-scenes peeks… Thank you! 500 DONORS IN 500 HOURS from Alex Drummond on Vimeo. Okay, so Dave didn’t actually find a human skull in the LA River, but the Friends of the LA River society he talks to on this episode of Brain Food Daily once did. Big deal, I say. Call me if they ever find my dignity. I dumped it in the river 10 years ago after a night of whiskey and wandering. Oh, to live the hobo life again…. Starting tomorrow night, you can catch The Wife every Tuesday at 9:30pm. 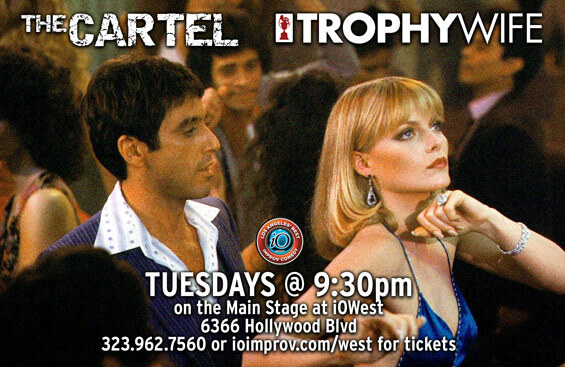 We’ve been paired with the excellent team The Cartel to bring you the most dangerous hour of improv in LA*. So join us at our shiny new Tuesday time slot – or, if you can’t make it, subscribe to our podcast so you’ll never miss another show. 323.962.7560 or ioimprov.com/west for tickets/reservations.